If you don't pay your tithe, the Guild could request your assistance, but show them your fancy red Guild dice and they may well let you off! Or recruit you all the same, because no trinkets can pay off the Guild! These dice are perfect for a Guild player, but are equally useful for everyone else, the red color meaning they're a perfect way to keep track of Life Points on any of your gang members. 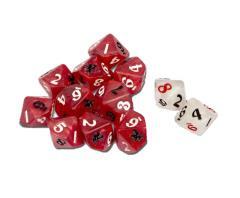 This pack contains 12 ten-sided dice; 10 in The Guild red, and 2 Destiny dice in white. Each number is delicately etched on, with the Carnevale lion taking the place of the 10. Not only that, but the 7, 8, 9 and lion are filled in a complementary color, making spotting Aces easier than ever!